The Met Office, which is the United Kingdom’s national weather service forecasts that temperatures for each of the next five years are likely to be 1C or more above pre-industrial levels. In the next five years there’s also a chance we’ll see a year in which the average global temperature rise could be greater than 1.5C. That’s seen as a critical threshold for climate change. If the data matches the forecast, then the decade from 2014-2023 will be the warmest in more than 150 years of record keeping. The Met Office says that 2015 was the first year in which the global annual average surface temperature reached 1C above the pre-industrial level, which is generally taken to mean the temperatures between 1850 and 1900. Each year since then, the global average has hovered close to or above the 1C mark. Now, the Met Office says that trend is likely to continue or increase over the next five years. The Met Office forecast comes as a number of agencies publish their full analysis of temperature data from 2018, showing it to be the fourth warmest since records began in 1850. 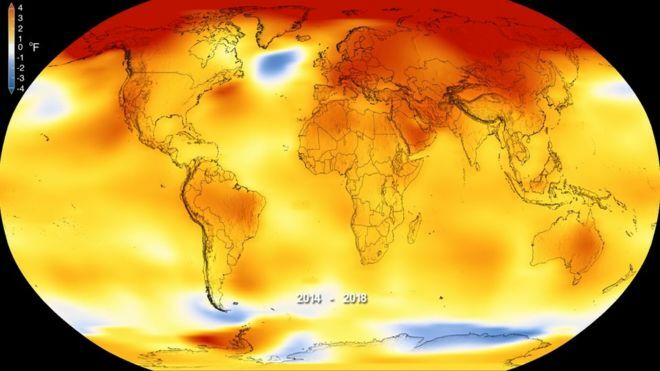 The World Meteorological Organization (WMO) has published an analysis of five major international datasets showing that the 20 warmest years on record have been in the past 22. “Temperatures are only part of the story. Extreme and high impact weather affected many countries and millions of people, with devastating repercussions for economies and ecosystems in 2018,” said WMO Secretary-General Petteri Taalas. “Many of the extreme weather events are consistent with what we expect from a changing climate. This is a reality we need to face up to. Greenhouse gas emission reduction and climate adaptation measures should be a top global priority,” he said. Other researchers in the field said the new forecast for the next five years was in line with expectations, given the record level of CO2 pumped into the atmosphere in 2018. “The forecast from the Met Office is, unfortunately, no surprise,” said Dr. Anna Jones, an atmospheric chemist at the British Antarctic Survey. Be the first to comment on "Climate change: World heading for the warmest decade, says Met Office"